It’s not easy to find a bargain in London, especially when it comes to property. However, our latest research has highlighted the best bargain postcodes for property sales and rentals across the capital. A bargain doesn’t always mean cheap, and while Barking and Dagenham might be the most affordable overall across London, we’ve found that the biggest bargains are actually further up the house price ladder. We looked at postcode house price and rentals data from Propdex (sales) and Home.co.uk (rents) for every London postcode area and how they compared to the wider average for the borough. 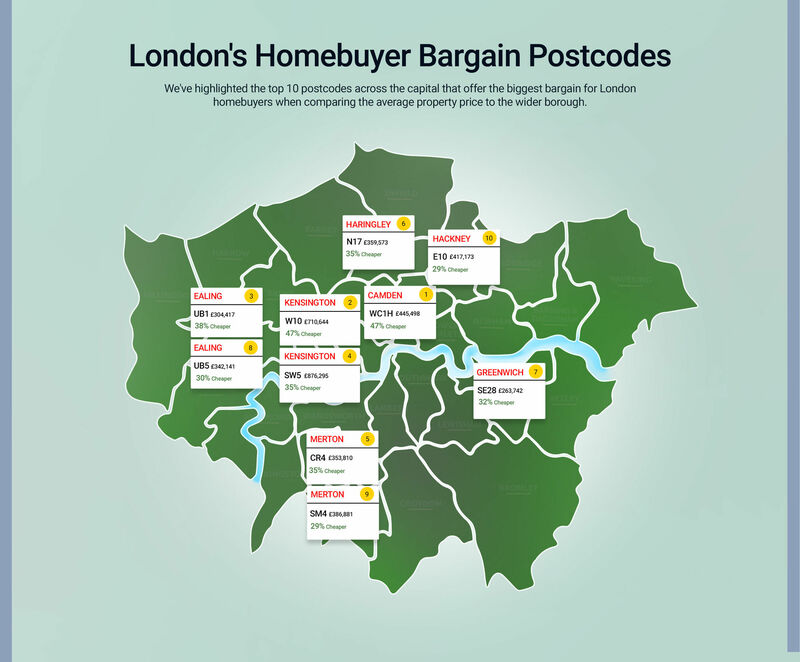 We then ranked all London postcodes by how much of a bargain they offer to both buyers and tenants looking to buy or rent in each borough. With an average price of £445,498, Camden’s WC1H is the biggest bargain postcode in London, 47% cheaper than the borough average of £846,663. Kensington and Chelsea’s W10 is the capital’s second-biggest bargain buy at £710,644 on average – also 47% cheaper than the £1,349,791 across the borough as a whole. UB1 in Ealing (38%), SW5 also in Kensington and Chelsea (35%), CR4 in Merton (35%), N17 in Haringey (35%), SE28 in Greenwich (32%), UB5 in Ealing (30%), SM4 in Merton (29%) and E10 in Hackney (29%) are all in the top 10 for the best bargain buys in London. Although Barking and Dagenham is often considered the most affordable area to buy because of the borough’s overall price, it doesn’t make it the best option for every London house hunter. What this research shows is that there are bargains to be had in every area of London, at every rung of the ladder and every price bracket. You might wish to live in Westminster W1K, but if the average house price of £3.6m is too steep, you can live in W9, which is considerably cheaper, while avoiding a move outside of the borough. When it comes to the rental market, there’s a slight change in where the best bargains are located, however, the top spots are still in some of London’s more prestigious boroughs. 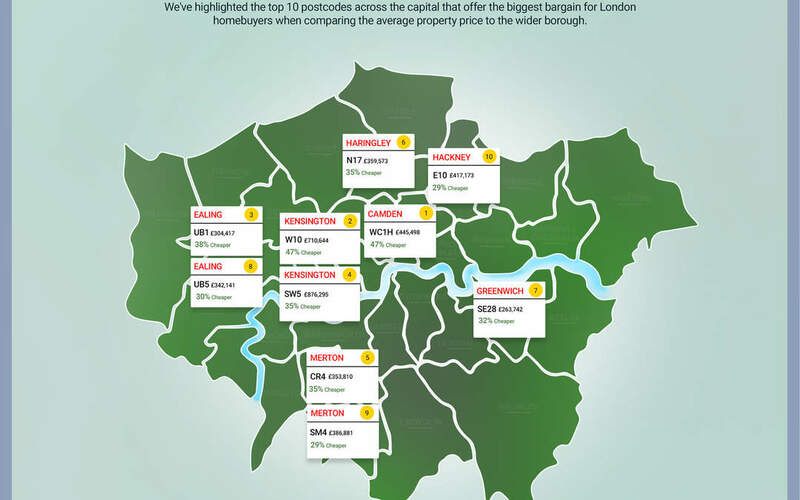 W9 is at the top of the list with a difference of 49% between the average rental cost and the borough as a whole. It’s followed by TW12 in Richmond upon Thames with a 43% difference and W10 in Kensington and Chelsea where rental costs are 40% lower on average when compared to the wider borough. Next up is W12 in Hammersmith and Fulham (39%), TW2 in Richmond (37%), W2 in Westminster (35%), NW9 in Barnet (34%), SM4 in Merton (33%), TW11 in Richmond (32%) and CR4 in Merton (32%). If you’re saving to get on the property ladder, living on a budget is the best way to ultimately be able to buy. Therefore, by adjusting your rental expectations slightly and compromising on a more affordable postcode in the same borough, you not only stay close to the area you like but also have a little extra to tuck away at the end of each month. With the impending changes to tenant fees and the introduction of recent legislative measures, there’s a good chance rent costs will continue to rise. This will be partly due to letting agents looking to recoup lost finances through other means, as well as landlords continuing to exit the buy-to-let sector and widening the gap between available supply and tenant demand. With this in mind, it’s advisable for those currently living at the top end of their rental affordability threshold to evaluate where else they could live, in order to provide themselves with a larger financial cushion.